English (Traduci questo testo in Italiano): Gulliver's Lake RV Resort & Campground approximately 30 minutes NW of downtown Hamilton ON Canada. This is a good location for seasoned and novice divers alike. Many diving schools come here for training and diving. As host of the 2002 Provincial Triathalon, Gulliver’s Lake is also a popular training spot for local triathletes. Dive access is walk-in from the shore. Drop off is within a few feet of the shore. There are various submerged platforms @ 15+ feet for practicing skills (e.g., mask clearing and neutral buoyancy). The fine silt/mud bottom can make for poor visibility and sometimes algae also reduces visibility. I saw some small mouth bass from the shore but no fish while diving (Sep 2018). English (Traduci questo testo in Italiano): Gulliver's Lake RV Resort &amp; Campground approximately 30 minutes NW of downtown Hamilton ON Canada. This is a good location for seasoned and novice divers alike. Many diving schools come here for training and diving. As host of the 2002 Provincial Triathalon, Gulliver’s Lake is also a popular training spot for local triathletes. Dive access is walk-in from the shore. Drop off is within a few feet of the shore. There are various submerged platforms @ 15+ feet for practicing skills (e.g., mask clearing and neutral buoyancy). The fine silt&#47;mud bottom can make for poor visibility and sometimes algae also reduces visibility. I saw some small mouth bass from the shore but no fish while diving (Sep 2018). Gulliver's Lake RV Resort &amp; Campground approximately 30 minutes NW of downtown Hamilton ON Canada. This is a good location for seasoned and novice divers alike. Many diving schools come here for training and diving. As host of the 2002 Provincial Triathalon, Gulliver’s Lake is also a popular training spot for local triathletes. Dive access is walk-in from the shore. Drop off is within a few feet of the shore. There are various submerged platforms @ 15+ feet for practicing skills (e.g., mask clearing and neutral buoyancy). The fine silt&#47;mud bottom can make for poor visibility and sometimes algae also reduces visibility. I saw some small mouth bass from the shore but no fish while diving (Sep 2018). English (Traduci questo testo in Italiano): Gulliver's Lake RV Resort &amp;amp; Campground approximately 30 minutes NW of downtown Hamilton ON Canada. This is a good location for seasoned and novice divers alike. Many diving schools come here for training and diving. As host of the 2002 Provincial Triathalon, Gulliver’s Lake is also a popular training spot for local triathletes. Dive access is walk-in from the shore. Drop off is within a few feet of the shore. There are various submerged platforms @ 15+ feet for practicing skills (e.g., mask clearing and neutral buoyancy). The fine silt&amp;#47;mud bottom can make for poor visibility and sometimes algae also reduces visibility. I saw some small mouth bass from the shore but no fish while diving (Sep 2018). English (Traduci questo testo in Italiano): Gulliver's Lake RV Resort &amp;amp;amp; Campground approximately 30 minutes NW of downtown Hamilton ON Canada. This is a good location for seasoned and novice divers alike. Many diving schools come here for training and diving. As host of the 2002 Provincial Triathalon, Gulliver’s Lake is also a popular training spot for local triathletes. Dive access is walk-in from the shore. Drop off is within a few feet of the shore. There are various submerged platforms @ 15+ feet for practicing skills (e.g., mask clearing and neutral buoyancy). The fine silt&amp;amp;#47;mud bottom can make for poor visibility and sometimes algae also reduces visibility. I saw some small mouth bass from the shore but no fish while diving (Sep 2018). English (Traduci questo testo in Italiano): Gulliver's Lake RV Resort &amp;amp;amp;amp; Campground approximately 30 minutes NW of downtown Hamilton ON Canada. This is a good location for seasoned and novice divers alike. Many diving schools come here for training and diving. As host of the 2002 Provincial Triathalon, Gulliver’s Lake is also a popular training spot for local triathletes. Dive access is walk-in from the shore. Drop off is within a few feet of the shore. There are various submerged platforms @ 15+ feet for practicing skills (e.g., mask clearing and neutral buoyancy). The fine silt&amp;amp;amp;#47;mud bottom can make for poor visibility and sometimes algae also reduces visibility. I saw some small mouth bass from the shore but no fish while diving (Sep 2018). English (Traduci questo testo in Italiano): Gulliver's Lake RV Resort &amp;amp;amp;amp;amp; Campground approximately 30 minutes NW of downtown Hamilton ON Canada. This is a good location for seasoned and novice divers alike. Many diving schools come here for training and diving. As host of the 2002 Provincial Triathalon, Gulliver’s Lake is also a popular training spot for local triathletes. Dive access is walk-in from the shore. Drop off is within a few feet of the shore. There are various submerged platforms @ 15+ feet for practicing skills (e.g., mask clearing and neutral buoyancy). The fine silt&amp;amp;amp;amp;#47;mud bottom can make for poor visibility and sometimes algae also reduces visibility. I saw some small mouth bass from the shore but no fish while diving (Sep 2018). English (Traduci questo testo in Italiano): Gulliver's Lake RV Resort &amp;amp;amp;amp;amp;amp; Campground approximately 30 minutes NW of downtown Hamilton ON Canada. This is a good location for seasoned and novice divers alike. Many diving schools come here for training and diving. As host of the 2002 Provincial Triathalon, Gulliver’s Lake is also a popular training spot for local triathletes. Dive access is walk-in from the shore. Drop off is within a few feet of the shore. There are various submerged platforms @ 15+ feet for practicing skills (e.g., mask clearing and neutral buoyancy). The fine silt&amp;amp;amp;amp;amp;#47;mud bottom can make for poor visibility and sometimes algae also reduces visibility. I saw some small mouth bass from the shore but no fish while diving (Sep 2018). English (Traduci questo testo in Italiano): Gulliver's Lake RV Resort &amp;amp;amp;amp;amp;amp;amp; Campground approximately 30 minutes NW of downtown Hamilton ON Canada. This is a good location for seasoned and novice divers alike. Many diving schools come here for training and diving. As host of the 2002 Provincial Triathalon, Gulliver’s Lake is also a popular training spot for local triathletes. Dive access is walk-in from the shore. Drop off is within a few feet of the shore. There are various submerged platforms @ 15+ feet for practicing skills (e.g., mask clearing and neutral buoyancy). The fine silt&amp;amp;amp;amp;amp;amp;#47;mud bottom can make for poor visibility and sometimes algae also reduces visibility. I saw some small mouth bass from the shore but no fish while diving (Sep 2018). English (Traduci questo testo in Italiano): There is a fountain in the middle of the lake ;) There are other items of interest submerged in the lake but I did not have time to investigate since I was with a group getting trained. There is a fountain in the middle of the lake ;) There are other items of interest submerged in the lake but I did not have time to investigate since I was with a group getting trained. Gullivers Lake Review - Nice lake about 45 minutes west of Toronto on the 401 West, take highway 6 south to Safari Road, make a right, drive 2 minutes and you are there. 6 Dollars per person. Scuba Divers must register with the front desk which takes 2 minutes. Very nice and clean water. The water was free of garbage, did not see one bit of anything but nice marine life and a few fish. You can BBQ if you bring your stuff, there is also a dive shop. Fish were friendly and very curious. There is a dive platform west, south west, of the lake. It is about 40-50 feet from the shore. It is shore diving all around, very easy to get in the water and dive. Very nice drop off on the west side to get right in. Also a cool geyser near the north east of the lake but did not get to close to it as we were practicing skills. Max depth about 30 feet. Visibility about 10-20 feet, not very silty but easy to kick it up as always. Vis can dip to about 5 feet depending on algae bloom. Best in May/June/Sept. 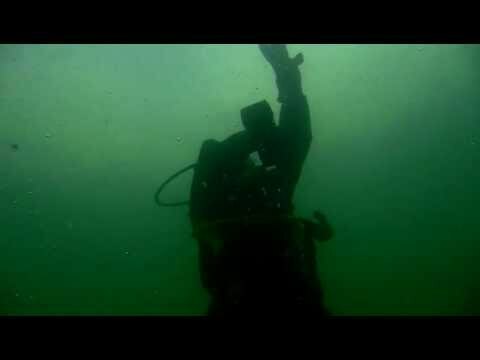 Good Begginer Dive - I weant to Gullivers Lake when I first recieved my open water license. I fould this place to have interesting sites such as large amounts of small mouth bass,a dive maze, sunken bycicles, sunken christmas trees and other such items. The visibility was very good with an average depth of 30". This is a very good begginers dive site.